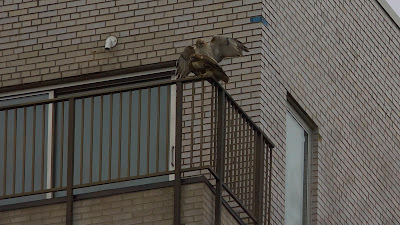 The photo tells it all: though yesterday was April Fools Day, the Fifth Avenue Hawks continued to demonstrate the seriousness of their relationship. The pair's romantic activities during the last few days can't help but raise great expectations for am exciting hawkwatching season this year. Note about nomenclature: We've heard a number of names for Pale Male's mate bandied around this year -- Pale Beauty, Ginger among them. Now that His Guyness [in Charles Kennedy's words] seems to have settled down with one reigning female, in deference to the PaleMale.com website I'll use that site's chosen name, Lima, from now on. [The name apparently refers to the ordinal number 5 in Indonesian, not to the edible bean]. But every move he made was with style and grace. 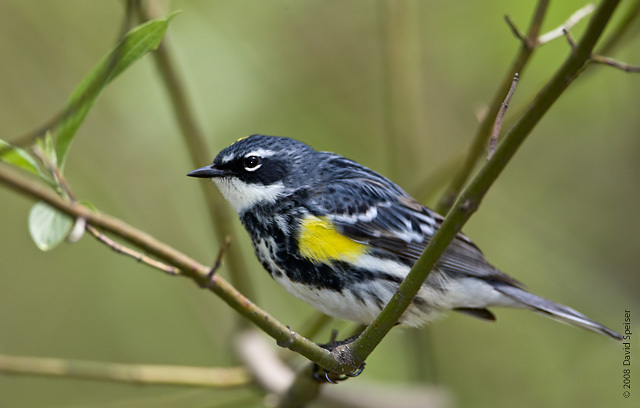 The spring migrants are beginning to arrive in Central Park en route to their breeding grounds. [And some will settle down to nest in the park itself.] So far the Eastern Phoebe and the Yellow-rumped warbler have been seen. Soon the trickle of arrivals will swell to a stream. The migration will reach its peak towards the end of April. Here's the announcement I just received from the American Museum of Natural History of their excellent Spring Bird Walks. WHERE Walks start across from the Museum on the northeast corner of Central Park West and 77th Street. ADMISSION $85. Limited to 25 people per series. For more information, call the AMNH Bird Walk Hotline at 212-313-7579.